Sontheim provides a broad range of CAN interfaces for deployment in various industries, environments and use-cases. Each interface uses the same multi-threaded API (application programming interface) allowing simultaneous access of numerous threads from application to network, an easy exchange of devices and a combination of interfaces. The Sontheim software tools consist of many components for field-bus configuration, control and analytics. 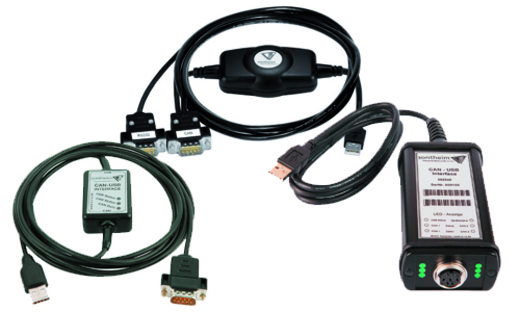 This piece of interface technology offers a CAN channel along with an EIA-232- (RS-232)-interface and USB for connecting to a laptop or desktop PC. It is the latest one in our portfolio and benefits from a powerful 32-bit microprocessor. Housing, cables and plugs have been designed with regards to a most resource- and cost-saving setup. The CANUSB is a CAN-to-USB interface that is used in mobile applications on notebooks and desktop PCs. As the CANUSB is built into a massive aluminum case with a size of 100 mm x 57 mm x 32 mm, it can also be used in rough environments. The field-proven interface holds several technical attributes for a maximum of usability. Its optional features like error-frame detection and analog level measurement for the physical CAN networks level make it a reliable and easy-to-use interface for various applications in the fields of automation and automotive. It provides two opto-isolated CAN channels with a data transmission of up to 1 Mbit/s. on both channels. The device is available in different versions, e.g. only one single CAN-channel and less diagnostic functions. For standardized applications with only one CAN channel, the Sontheim Industrie Elektronik GmbH supplies the CANUSBlight with one opto-isolated CAN channel. This CAN-to-USB interface is built into a compact synthetic case with a size of only 52 mm x 3 6mm x 21 mm and even more suitable for a mobile use. All mobil interfaces can be used with Windows versions like 2000, XP Embedded and Professional, up to Vista and Windows 7. The PowerCAN-PCI is a CAN interface and controller card for the PCI bus which provides up to three opto-isolated CAN channels to the user. Each channel has a maximum transfer speed of 1 Mbit/s. The PowerCAN-PCI is used as a controller card in complex machines. Its C167 micro-controller provides high computing power, which is topped up by 16 KiB DPRAM, 256 KiB Flash and 256 KiB RAM. As a producer of industrial PCs, Sontheim also offers the PowerCAN card as a CPCI and a PC104+ version for embedded purposes with up to two opto-isolated CAN channels. The next generation of the CAN controller family has several new hardware features for increased performance. It contains a 32-bit Coldfire microprocessor as well as 32 KiB DPRAM, 2 MiB Flash and 8 MiB RAM. There are two opto-isolated CAN channels and additional diagnostic functions integrated like level measurement and an error frame detection that allows seeing the relation between error frame and timestamp. The PowerCAN-PCI V2 is available as a PCI or PCI104 version. The firmware update is handled directly via USB or PCI interface with a free software tool to keep the CANUSB features up-to-date. Moreover, the hot plug-and-play system enables an even faster and more efficient application without the need for restarting the computer. More detailed information about the Sontheim interfaces and their related software tools are available on www.sontheim-industrie-elektronik.de. You can also contact us directly, we are happy to discuss your application requirements in detail. We are looking forward to hearing from you soon.